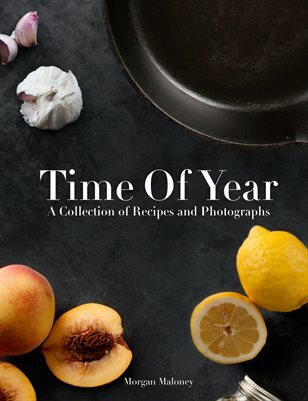 Morgan Maloney's senior photography thesis, Time Of Year, is a collection of some personal favorite recipes accompanied by artful food photography. The photos are meticulously styled and formed into this "art cookbook", creating a practical aspect to her photography. The book features two recipes each for all four seasons: one sweet and one savory dish for each time of year.